We have had so much going with other things since we bought our land that things have been super slow getting the homestead up and running. We do just about have the driveway ready for the 175 cubic yards of crusher run to “pave” it. We have had to cut, and dig, and plow, and scrape to get 950 feet of 12 foot wide driveway cleared. We have been holding off with trying to build ANY structure until we can get the truck all the way back to the building site. We are close now. This week is the trip to NYC for my competition and filming for Forged In Fire. Once that’s done we should be able to work on the farm more than 2 days a month. Its hard to believe that we technically got all that done in 8 days work. Even though those 8 days stretched over 4 months. Once I get done with the show, it will be game on with the farm. Just a tad bit more compaction and then the gravel. And then, we can get some structures up. Its way past my bedtime as I need to get up tomorrow, complete an order for some woodworking holdfasts that someone ordered today and then stress about New York some more. We hope you all have wonderful week. With just over a week before we travel to the big Apple so I can compete on Forged In Fire, we have been busy preparing. I’ve been trying to get the shop cleaned and organized in the event that I make it to the final round. There’s a lot to making sure all of the welding tanks are full and that I have all the little supplies necessary to complete a mystery project. Even with all of that AND both of us working full time, the work on the farm doesn’t end. We recently had a friend give us a 14 inch single bottom plow. That was a great gift and has already come in handy. Our first major project is getting a manageable driveway in place. Once that’s done we can start building our temporary cabin/work shed. We’ve got to get tools and supplies back to the work site. Today we bought a 5 foot grader blade to help with that project and many more to come. We’ll be putting them both to work this Saturday. Today, I had to give an interview by phone with a production guy for the tv show. He asked a ton of questions for over an hour. Without thinking, I replied that we need 175 cubic yards of gravel for our homestead. He paused for a moment and then said “I don’t think I’ve ever heard anybody say something that specific. Normally its ‘take a vacation’, ‘make shop improvements’, stuff like that. Nobody has ever said 175 cubic yards of gravel” with a little laugh at the end. I don’t know if he thought I was being funny or not. I wasn’t. As I meet people, and they get to know me, they begin to realize that everything I do is for the homestead. Building that life and farm to create the life that Maria I long for is the end goal for everything. Whether I’m weird because I get excited about tractor implements and 175 yards of gravel or not really doesn’t make much difference because I DO get excited about those things. 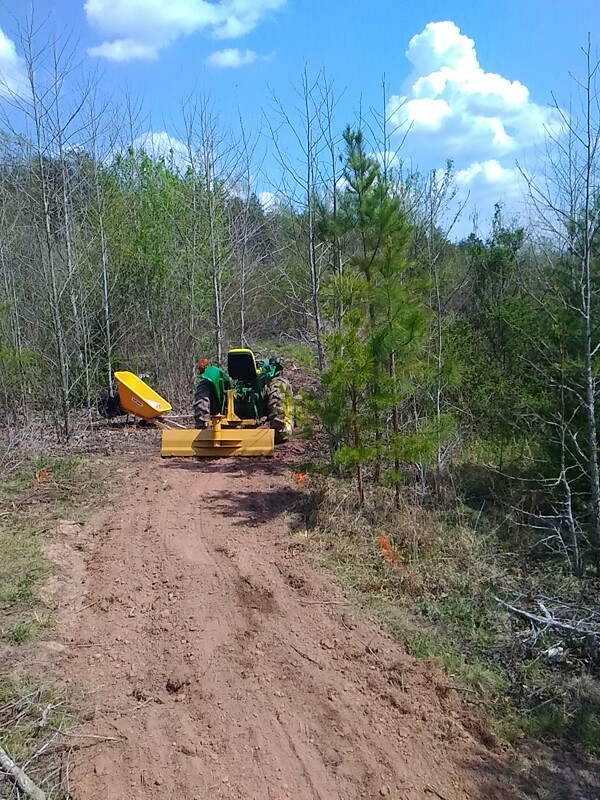 We hope that you all have a wonderful week, and hopefully we will have some photos this Saturday when we get that 1000 foot driveway all graded and ready for that gravel. 18 Days until the competition and working on the farm..
As some of you may know I’ve been invited to compete on the History Channel show Forged in Fire. I’m super excited about it, but nervous as can be. I’m confident in my abilities as a Blacksmith and a Bladesmith. I’ve got alot of really satisfied customers…but this is a competition with a time limit, and some other unknown variable thrown in. From what I’ve noticed by watching the episodes I’ve recorded over and over is that any of the smiths can beat any of the other smiths on any given day. It all really depends on who has a good day, and who has a bad day…I’m really hoping for a good day. All in all, we are both excited about traveling to NYC (not our first choice for a vacation spot) because neither of us have ever been. And this should be a fantastic experience. Maria has a true talent with dyes and cotton…and I’m not just saying that because she’s the love of my life. Need proof? Slide on over there and check them out…you won’t be disappointed..
We haven’t had a ton of chances to get up there to work, but when we do we tend to get alot done. We had a guy give us a single row, 14 inch bottom plow for the tractor and that’s been a big help with removing roots and small stumps. There are just SO dang many of them. Maria has been cutting brush like a fiend with the weed wacker/saw blade combo. 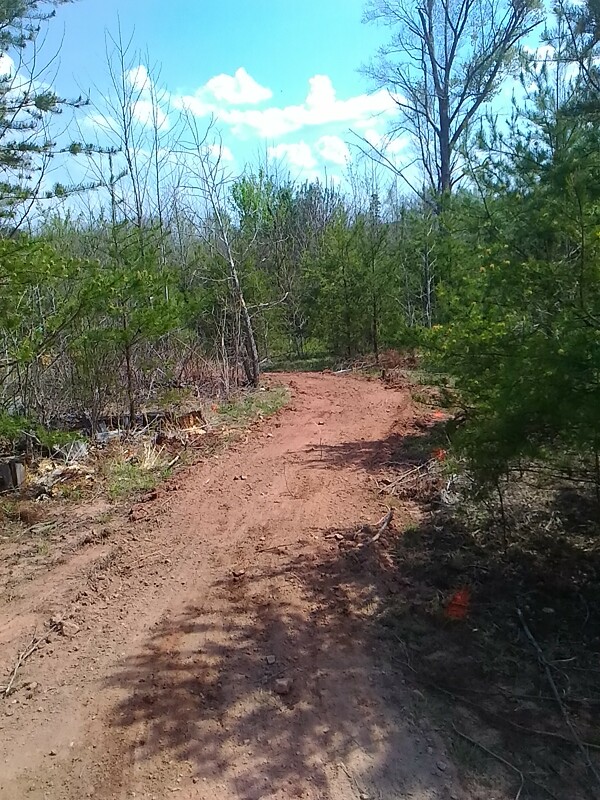 We’ve got 1000 feet of driveway, and about 70% of the area where we’ll build the cabin/shed, barn, and eventually house. Now to figure out how to not have the driveway turn into a muddy mess. Things tend to start getting sloppy after a while. Gravel will be necessary eventually…ALOT of gravel. but once the small trees, shrubs, and briars are all cleaned up we’ll plant some rye to have a better root mat that we should be able to drive on. As of now, we can’t burn anything we’ve cut until after April 30. I know that isn’t that far away, but it’s piling up quickly. This past week we also ran into a slight drainage problem..not huge..but there was apparently a pretty hefty rain storm yesterday and down by the creek there was some standing water in the bottom land and the creek had risen about 2 feet. It was still well within the banks, but it was swollen and rushing pretty well. From the time stamp, you can see this was on the 29th…nice and dry….. Same spot, same camera…only on the 1st…alot of standing water…we’ll see how quickly it drains..hopefully fast. It’s a good thing my boots are water proof..LOL..
We hope that everyone has a great week as things start to green up for spring. Whenever they tell me the episode of Forged in Fire will air I’ll let everyone know..I’ll probably be shouting it from the roof tops…LOL..until the next post…..take care.